Personalize your PD by using tools like Google Forms, Padlet, and Nearpod to learn what teachers already know and what they need to know. I've had the pleasure to deliver and be part of countless sessions and workshops, and I can tell you from first-hand experience that there is nothing worse than a presenter who doesn't know his or her audience. Adult learners carry with them a very diverse set of skills and needs. To prepare a one-size-fits-all (or most) session does everyone a disservice. Whether you work in a district as an instructional support staff or you provide ancillary development as a contractor, the three tools and tactics featured in this post will provide an effective means to gauge the needs of your audience and chart your course to effectively support them. Before fine-tuning content for a particular session, I start out with a Google Form and a list of suggested topics (e.g. Google for Research, Nearpod, Kahoot, Student Projects with iPad, Workflow with eBackpack) that I perceive to be campus or department needs. Based on this initial feedback, I begin crafting pre-needs assessments for particular courses. Even within a workshop focused on a specific tool or technology, you will find both novice and advanced users, so that's where the pre-needs assessments really pack a punch. I find these are best used with longer workshop sessions. 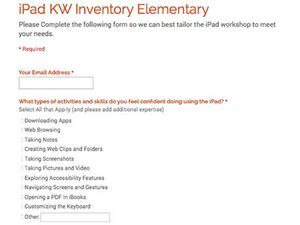 As I prepare a workshop for either elementary or secondary, I provide a Google Form to gain some further insight into how the devices are currently being used and what familiarity teachers have with the devices and a handful of apps. The forms are fairly similar in nature, but the secondary form focuses on a different set of applications. 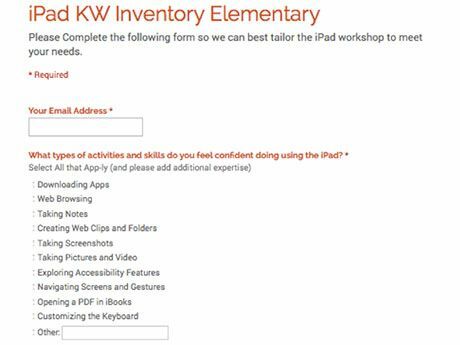 The information gleaned from this survey allows me to carefully craft a personalized learning experience for our attendees by steering clear of familiar apps, providing a deeper focus on a particular skill, or discovering solutions for grouping attendees to achieve optimal collaboration within the day. 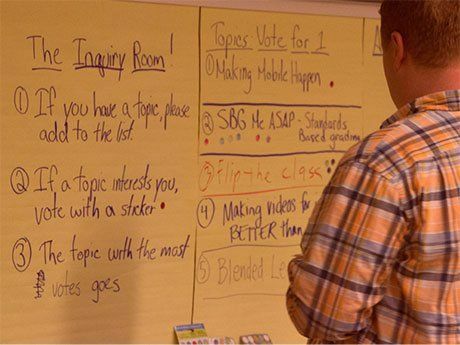 This online sticky-note tool is a fabulous way to get a quick pulse of the room. A link to the site can be sent out prior to the session via participants' email addresses or used as a warm-up activity when they arrive. Recently I began creating my own backgrounds for Padlet to allow for added customization of the tool. 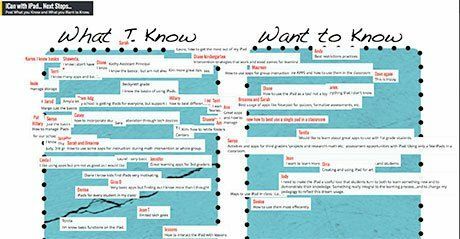 One of the more popular ones is "What I Know and Want to Know." This is not only a great ice breaker to discover experts in the room, but it can also be a truly enlightening piece of information. While delivering a SAMR session, I quickly realized that very few people even knew what the acronym meant, let alone how to apply it. This integral info truly helped me tweak my content on the fly to better meet the needs of this particular group of educators rather than alienating the majority of them with a fast-paced pitch. This assessment presentation hybrid tool is the perfect way to gain feedback that can truly be formative in a professional development setting. I typically start out with a question like, "What are some successful strategies you have used with integrating technology?" Then I follow up with, "What questions and concerns do you have about managing devices in the classroom?" With these two questions, I get instant feedback from the majority of participants on their strengths as well as their concerns. I can also easily address trends within the responses ("I see that quite a few of you have issues with off-task behavior in the classroom") and then connect them with other participants in the room that have strengths in this area. ("Sonia, didn't you mention you use an iPad Oath with your class? Would you care to elaborate?") Typically, I find that most groups of learners have advanced, average, and beginners within each topic. After initial discussions, I provide a tiered resource that supports the differentiated needs of the group. A bulb has worked really well for this purpose and can be pushed out to participants via the Nearpod portal. As educators, we frown upon one-size-fits-all education and preach personalized learning, yet we still deliver canned in-services and seminars time and time again, never addressing the needs of a specific audience of learners. While these tactics and tools alone will not single-handedly transform the beaten path of professional development, they do provide sound ideas for gathering pre-assessment data from participants that can be used to inform our planning and decision making within this realm. What tools and tactics do you use for pre-assessment? Add your favorites and ideas in the comments.